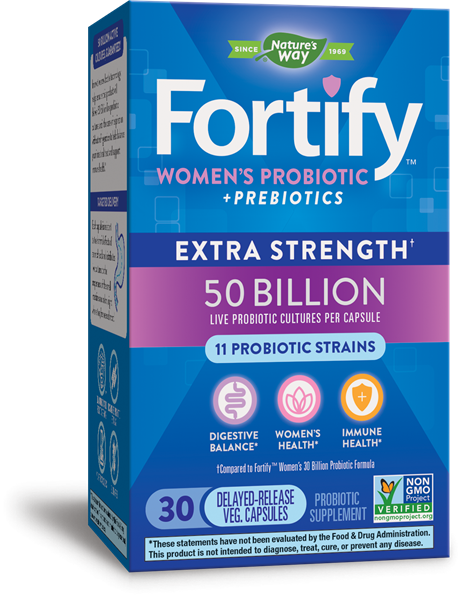 Fortify™ Women's 50 Billion Probiotic Digestive - Nature's Way®. 50 Billion active cultures guaranteed! Each capsule is resistant to the harmful effects of stomach acid and distributes live cultures to the proper area of the small intestine and colon, right where they’re needed most. BI-04® is a trademark of DuPont. In the USA, NCFM® is a trademark of the North Carolina Agricultural Foundation, Inc. NCFM® and BI-04® are used under license.